IT service management (ITSM) is evolving rapidly as more and more enterprises pursue digital transformation. At the same time, cyber security threats are growing in number, sophistication, and impact on the operations, revenues, and reputations of victimized companies. Meanwhile, at too many companies, service and security management are still operating in separate silos, with cooperation happening only after a threat becomes a successful breach. How best to move to a structure in which service and security management are integrated, proactive enablers and accelerators of your business? At many companies, this is one of the goals driving an increased focus on security operations, or SecOps. But there are technological, cultural, and organizational challenges to your efforts to bring IT service management and security management closer together. Join Industry experts Michael Dortch, Mike Bombard and Taylor Lehmann for a stimulating and informative discussion of these challenges and how companies are addressing them successfully. You’ll learn things you can do now to improve both service and security management at your company. Continual Service Improvements and minimizing the impact of Major Incident Management are critical to keeping your business running smoothly and out of the nightly news headlines. 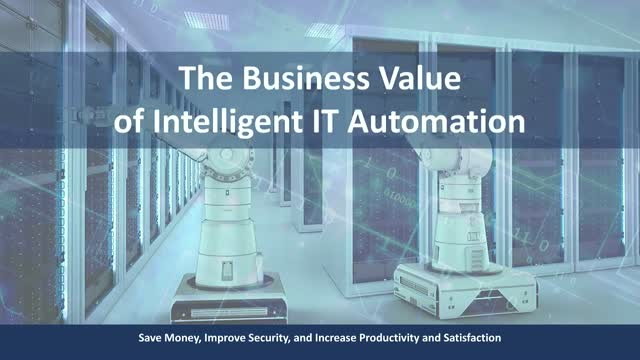 This webinar, presented by ITSM process expert Ryan Schmierer and IT Service Management technology expert Mike Bombard will explore the role technology capabilities and process improvement can play to improve outcomes. Ryan and Mike will discuss lessons learned from a major healthcare company case study and the challenges this company faced in managing major incidents. They will provide 5 things you can do today to improve major incident management and will discuss how by leveraging capabilities from discovery and infrastructure visualization tools will help your staff gain the insights they need to resolve issues quickly and continually make better-informed decisions. The modern digital enterprise depends on EA, ITSM and IT project teams working together and sharing information as a cohesive unit. In this session, we will share some tips on how to make that a reality. In many organizations, Enterprise Architecture and Service Management & Operations are separate functions that rarely interact with each other and business users are the ones paying the price. This session will look at how architects can use operational insights to design better technology solutions; how operations staff can use architecture models along with other configuration data to better assess impacts, risks and diagnose issues; and how these functions together can enable a more agile business environment. Minimizing the time taken to identify a security breach enables a company to mitigate the problem and limit the potential damage to its data and reputation. Deploying an automated detection and response tool gives security practitioners the insight they need to respond to cyber-security attacks. While still in its infancy, Artificial Intelligence and Machine learning technologies have the ability to recognize trends in data patterns, analyse and learn from them.The advances promise to bring huge value to business that can leverage this information. Kevin talks about his book "World Class ITSM" which focuses on the journey of the Helpdesk to Service Management, where it has been proven to work and what is aspirational for the future of ITSM to do things better. There are many aspects to security, whether it be mitigating personal risk from an unsecured wifi connection, to managing risk for an enterprise. Security is about trust and being able to identify all areas of risk, then mitigate them. Its also about being adequately prepared to handle a breach should the worse happen. Jed talks about End User Computing (EUC) and how IGEL (@igel_technology) has revolutionized endpoint management software by standardizing the user experience with their Universal Management Suite. Bryan talks to the 10 in Tech team about SparkInfluence, a new breed of advocacy and engagement platform to quickly educate and empower stakeholders to action, identify influencers, reach decision makers and affect change. Modern Service Management is not another framework, or set of books or IP. It is designed to enable ITSM professionals to focus on business outcomes. Steve Brodie talks about how to create a simple, repeatable way to collect and view information from any DevOps tool along the pipeline in the context of a single release, and deliver metrics that provide real business value. As traditional security perimeters dissolve, companies are becoming more reliant on human-centric cyber security systems that can protect their most valuable assets at the intersection of users, data & networks. Attacks are getting more sophisticated and more targeted. Endgame takes a different approach to security and extends traditional anti virus protection from malware, to exploits, malwareless attacks, and ransomware. Ashwini speaks to the 10 in tech team about the changing nature of security threats. Improved server monitoring solutions provide IT staff with better visibility into their operations, enabling them to deliver more effective IT services. Jon Cavanaugh, Sr Sales Engineer / Mgr Operations at OP5 talks to the 10 in Tech team about how this drives better business outcomes. How cloud based business phone systems are enabling true workforce mobility through ease of use voice communication from any device. Effectively eliminating the need for a traditional desk phones and PBX systems is discussed with Brian Peterson, Co-Founder & VP Engineering at Dialpad talks and the 10 in Tech team. Game Emulation Module tool for managing interactive narratives that simplifies the challenges for game developers handling complex, interactive story development is discussed by Mark Kennedy, CEO, and 10 in Tech team. The IOT ecosystem is now a reality for many organizations. The proliferation of IOT sensors generate masses of data that can be looked at in new ways. Using AI and machine learning to analyse this data can drive more value for companies. Steven Convey (@SteveAccenture) Managing Director, Technology, Accenture Inc. (@AccentureCanada) chats with the Ten in tech team about the new Liquid Studio that has recently opened in Toronto. He outlines how it brings together people, tools and technology to help them understand and manage the changes being driven by digital transformation. In today's digital marketplace, information is everywhere. You spend countless hours trying to stay up to date with news, informative how to's and vendor information for solutions you need to run your business. IT Chronicles is built for you. We have taken what we know is missing and given you what you want. One destination that delivers all the current information from the best minds in the industry and a collective set of resources that help you get what you need.